Just about everyone is a fan of the world famous SLASH. From his early beginnings with Guns N’ Roses, all the way up to his present solo career, Slash has never been over looked as a musician. He’s definitely one of the best rock guitarists alive and actually looks (and dresses) as if he stepped right out of the 1970s. The master guitarist and songwriter is hitting the road with his band and will be on tour with Myles Kennedy and The Conspirators. This tour is in support of their latest album together called World On Fire, thus the name World On Fire Fall 2015 North American Tour. 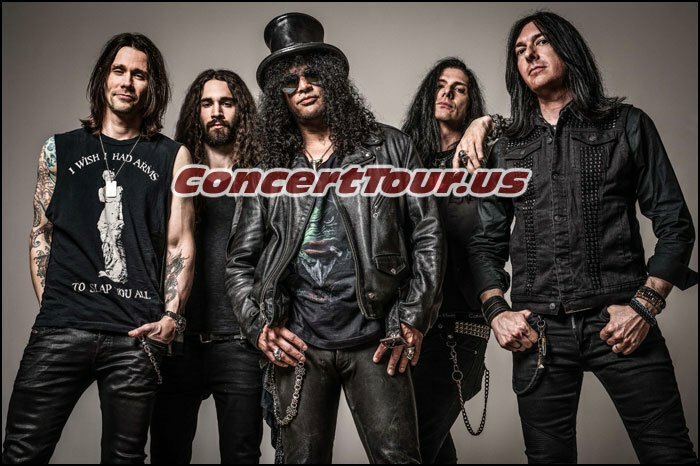 Slash and his touring buddies will be performing in a bunch of states in North America, including New Jersey, Rhode Island, Ohio, Michigan, Indianapolis, Louisiana, Kentucky, Minnesota, Colorado, California, Arizona along with several cities up in Canada. As for a set list, we have no idea what Slash will play or how far back he will go with his music. Hopefully he plays a lot of original Guns N’ Roses songs, to me he was the best during those years. Look Below for the latest list of SLASH Tour Dates, links to look for Slash Concert Tickets, and some cool Slash music videos. Check back often to look for any added Slash tour dates or newly listed concerts. SLASH Prepares To Tour With Myles Kennedy & The Conspirators in support of their latest album World On Fire. Slash is such an awesome guitar player. This concert tour of his is not to be missed. I hope you can at least make it to one of the live Slash concerts.